The Mad Big lens Review by Tom A.H. Piel (Tigers Lair ). All materials written by author permission. For an 85 mm this thing is big. And I do mean BIG. This is probably one of the Biggest 85 mm's around and it weighs around 1K. I've only used this lens on my Canon Eos. I refitted my Eos (500n Silver) with an Eos to M42 convertor. The Helios and its adapter (Jolos). 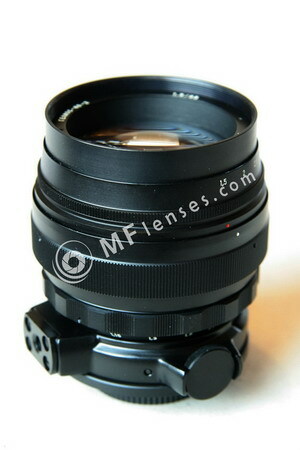 These adapters are around 20 dollars and give your EOS acces to all the M42 lenses. There is one drawback. You can only use preset lenses and lenses that can be set to manual. The Canon can't handle a M42 auto lens. There just isn't a lever for it in the camera. And here it is.... A canon Eos 500n retrofitted with a M42 Helios 40 lens from the seventies. A totally crazy combo. Now you see why this article is called "the Mad Big lens". The combination is insane, MAD... Why use a seventies lens on a nineties camera? I mean, if you buy an Eos you get this nice LIGHT 28-80mm, right? And now you put on a nonautomatic, non autofocus, heavy, preset lens from Russia on it? And it is heavy! It weighs around 1 Kilo. Well... It is fun to retro every now and again. And the Helios 40 is considered to be a good lens. Since I found this one at a reasonable price I wanted to see if it really was so good. Because of the weight and size of this lens you expect quality and the Helios 40 delivers. It outperforms my 28-80 standard lens from canon. And it is faster. The Canon starts at fstop 3.5 but the Helios starts at 1.5. In the sun my Canon gave of the error that it couldn't shoot any faster than 1/2000. That is how much light came in. I was shooting at an fstop of 4 with a speed of 1/1500 with Iso 400 film (Kodak ultra). I could easily have taken 100 iso. Even 50 would have done in the full sun. The shots were good. Offcourse the whole comparison of the Canonlens vs the Helios isn't really a good one. The canon is a zoomlens and gives a lot of flexiblity and gives nice shots. The Helios is a big preset lens 1.5/85mm short tele and comes from the cold war era. Don't ask me what the fstops were in the 3 shots above, I really don't remember. I don't even recall if I shot lower than 1/125th of a second. But I like the shots. I love the middle one. The Mad Big lens is fun. It has a good even great quality that I love to use. But it is a heavy and expensive lens prices on ebay are around 100 to 150 dollars and sometimes this is without the leather box and the filters. Mine didn't have them but I paid way less. A better alternative is the Jupiter 9. Also preset and at fstop 2 is still faster than a lot of other lenses. But the Helios is just a little bit nicer. I find it easier to operate (personal opinion) and I love the sight of this enormous lens on the Canon. It proves that even though it is an older lens it delivers quality that I can't get with my "standard" lens.